5 Carpenters Cottages01502 742022work01502 742022fax Self-cateringNo. 5 is one of an L shaped terrace of 18c cottages built in flint and pantiles situated on the edge of Holt. This luxury cottage is tastefully decorated, has a modern kitchen with dishwasher, a new bathroom and heating system, and new wooden flooring. A double and twin bed sleeps 4 in comfortable beds, there is a small shared shingle garden at the rear of the property. No. 5 is one of an L shaped terrace of 18c cottages built in flint and pantiles situated on the edge of Holt. 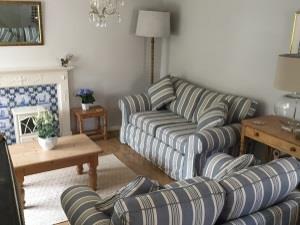 This luxury cottage is tastefully decorated, has a modern kitchen with dishwasher, a new bathroom and heating system, and new wooden flooring. A double and twin bed sleeps 4 in comfortable beds, there is a small shared shingle garden at the rear of the property. 4* Facilities include Luxurious Egyptian Cotton bed linen and towels, antiallergenic Hungarian goose down duvets and pillows, complimentary toiletries and slippers. fridge, dishwasher and luxury bathroom. WIFI A cosy and comfortable cottage.. Children welcome from age 5. From A47 leave Norwich travelling north on A140 past Norwich Airport. Fork left onto B1149 to Holt for 17 miles. On reaching the roundabout at Holt, go straight over onto the A148, Carpenters Cottage is 200 yards on the right hand side. From Sheringham Railway station, leave Sheringham travelling west on A148 to Holt. On reaching the roundabout at Holt, turn right staying on the A148, Carpenters Cottage is 200 yards on the right hand side.